We are proud to offer the brick campaign and hope you will support it. 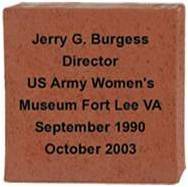 Donate a customized brick that will be placed in landscape areas around the outside of the US Army Women’s Museum located at Fort Lee, VA. Your brick will be a lasting tribute to honor a service member, a civilian, a spouse, a friend, a family member, a retiree or yourself. Each brick donation also provides support to the museum to help with exhibits, outreach and educational events. Bricks are available in two sizes: a 4″ x 8″ brick for $50.00, or an 8″ x 8″ brick for $250.00. Brick Graphics of your choice may be added at no additional cost. Your donation is tax deductible. The 4″ x 8″ brick allows a maximum of 3 lines – 18 Characters per line without a graphic; 10 Characters per line with a gr aphic. Available in – Regimental Red, or Tumbleweed. The 8″ x 8″ brick allows a maximum of 6 lines – 18 Characters per line without a graphic; 3 lines- 18 Characters per line with a graphic. Available in – Regimental Red only. 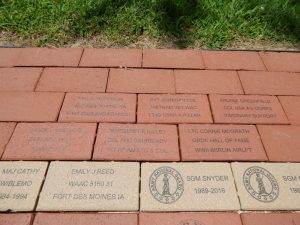 We place orders for personalized Bricks twice a year–on April 15th and on September 15th. Please place your order early so we can ensure your Brick is included in our next order! * We reserve the right to refuse a brick order. * Due to logistics, please allow us to select where your brick will be placed. * Once an order is submitted, orders are non-refundable and cannot be changed.